[miau] It’s one of the most believed sci-fi series of all time combined with one of the world’s favorite gaming past times. 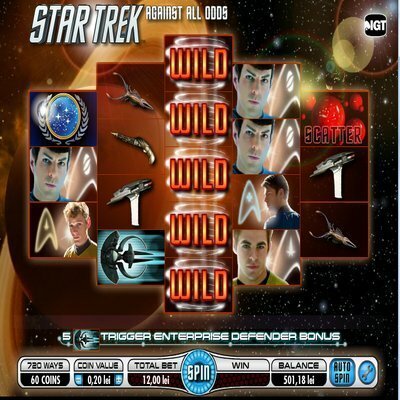 Star Trek: Against All Odds is an online video slot game powered by IGT, or Game Technology. It doesn’t matter if you prefer Kirk or Picard, if you enjoy working the digital slots, you are going to love this game. The inspiration is the Star Trek film where Spock becomes the prey of time traveling Romulans looking for revenge. From there, it’s five reels, bonus symbols and great opportunities to win alongside popular Trek faces, starships and phaser action. The game design is stunning. Beautiful graphics, solid special effects, including stars and asteroids, and a pounding soundtrack that will push you into a mood for adventure. Oh, and you get to win some prizes. It’s a five reel voyage with the first and fifth reels having three symbols, the second and fourth holding four and the middle reel shooting five. There are over 700 combinations that can result in payouts. You can go through the potential payouts at the paytable, accessible by clicking on the Paytable button. Symbols consist of, to name a few, Kirk, Spock, the Romulan ship, advanced laser guns, Romulan weapons, scatter red blood cells, a staff and a wild symbol. Once you get a good idea of the various symbols and their winning combinations, you’re ready to go where no player has gone before. This is probably a much more immersive gaming experience than the typical slot machine, online or otherwise. The bonus feature takes you to a new screen where your job is to protect Spock’s vessel as it sails through space. The further Spock gets and the more enemies he destroys, the more points you receive. At the end of the mission, you will be given ranking results based on the accrued points. The final numbers will determine which of nine bonus reels you get to spin for a prize. The better you do, the bigger the prizes on the wheels. You are also eligible for additional spins and multipliers. Even if this feature feels like a variation of the Wheel of Fortune bonus, the Star Trek slot manages to use it as a nice twist on slot games. At times, it can feel the player is more involved in a traditional video shooter than an online slot. Of course the force behind this online casino game is IGT, a leader in innovative gaming software, equipment and network systems. IGT was one of the first companies to introduce themed slot machines with 1989’s Double Diamond and Red White & Blue games. They have also been honored with a U.S. Senate Productivity Award. With Star Trek: Against All Odds, the manufacturer’s output for great online slots continues to grow.